Idol, American – Fox announced that its hugely popular reality TV show will move to Wednesdays and Thursdays. This begins Fox’s plan to run AI every single night of the week, then create an eighth day (probably Wednesday2) to fill with more AI. 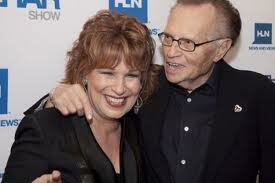 King, Larry – Frequent Larry King Live guest and substitute host Joy Behar appeared last week on the show, when King said “I made you!” Commentators say he was joking, but it’s possible that the ancient King actually did make Behar. Medium – The Patricia-Arquette-as-psychic mystery-solving series has been cancelled. She had to have seen this coming. Tremont-Morgan, Sonja – The Real Housewife of New York recently filed for bankruptcy, which she blames on legal issues after an aborted movie project with John Travolta. A few months prior, Tremont-Morgan was arrested for DUI, which she blamed on watching Wild Hogs. WGN – Morning news anchors at the Chicago station get super-excited about watching a live bridge demolition, but the camera feed cuts away for a few seconds and they miss it. The crew goes ballistic. I completely understand: I had the same reaction when I missed the According to Jim Christmas episode.